Fei Cui Gong Zhu is a 5 reel and 3 payline slot game produced by Playtech. The game has a Chinese theme that is incorporated throughout the game. The backdrop of the game is a crystal clear lake with mountainous landscape in the background. Each corner of the screen as well as the pay table is ornately decorated in reds and yellows. The symbols used in the game are all theme-related and players can expect to see Chinese artefacts and Chinese characters amongst the reels. The graphics are well drawn and have a realistic quality about them. The Free Spins Round is unlocked by players spinning in 3 or more Red Temple Scatter symbols anywhere on the reels. Players will automatically be awarded with 10 Free Spins. Free Spins can easily be re-triggered if another 3 or more Red Temples are landed during this round. Unless players land the Secret Garden bonus in this round, all their winnings will be tripled at the end. The Secret Garden Bonus round is activated by landing 3 Green Temple Bonus symbols anywhere on the reels in a consecutive combination. You will be taken to a separate screen that displays 6 pink flowers. Players will get to pick the same amount of flowers as the amount of Green Temple symbols they originally landed. Each pink flower you pick will reveal a cash prize that will be added together for your total winnings. The Wild Symbol in this game is the icon of the Chinese Lady. She has the power to replace all the standard symbols in the game except for the Temple symbols of the Scatter and the Bonus. 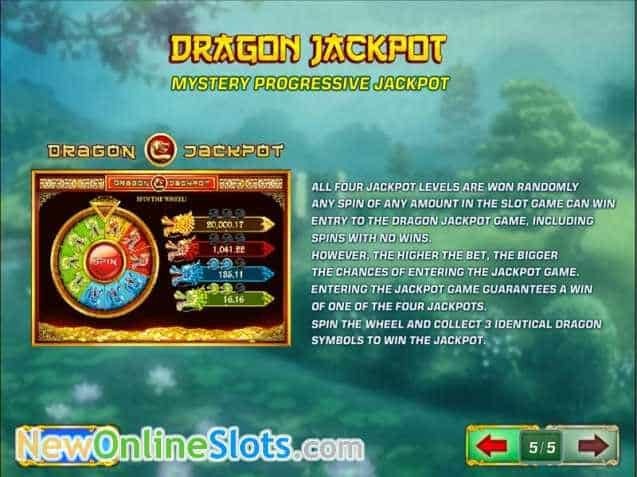 The Dragon Progressive Jackpot gives players the chance to win one of the 4 progressive jackpots, which amounts are displayed in the top corners of the screen. Players will need to spin a wheel of fortune which is randomly activated at any point in the game. If you spin in 3 matching colors in a row you will have one the Progressive Jackpot associated with that color. The higher your bet is the higher your chances are of triggering the jackpot. There is also a Gamble Feature in Fei Cui Gong Zhu. Players get the chance to double their money after every win by playing a simple card game. Players will have to guess between a red or a black card being dealt and if they guess correctly their winnings will be multiplied by 2x. The Wild is the symbol is the Chinese Lady and she can substitute for all of the game symbols except for the Scatter and the Bonus symbols. 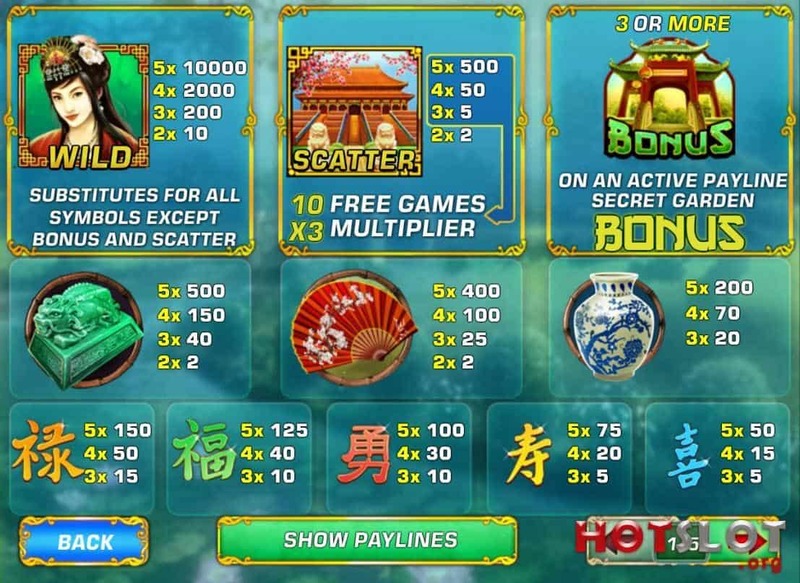 The Scatter symbol is the Red Temple and it award players with free spins and multipliers. The Bonus symbol is the Green Temple and activates the bonus game. Fei Cui Gong Zhu is one of Playtech's best Chinese-themed games. The graphics are good quality and are very detailed. The symbols and imagery are all authentically Chinese, as is the soundtrack. The game has a number of exciting bonus features for players to enjoy as they spin the reels. Overall the game is entertaining and there is massive winning potential, especially in the four Progressive Jackpots.